Lots of our customers are sick and tired of skinny little hangers that let amply-designed clothing fall to the floor, or leave strange bumps in the shoulders. We replaced our hangers with larger ones and now our clothes are in great shape. You can do the same. 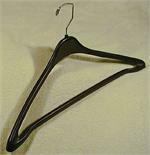 We've found several ample-sized hangers that will support your clothes in the manner they deserve. Most hangers are only 14 to 17 inces wide. Our GP hangers and Suit Hangers are 19 inches wide. The Original Superhanger is 20-1/2 inches wide! One thing you should know: Some hangers have a "contour" shape when viewed from the side, and are especially good for suits, coats, and outerwear; and some are flat, for shirts, blouses, and general use. IMPORTANT NOTICE: Before ordering our extra-sized hangers, you should check the depth of your closet space between the bar and the back wall. For 19" hangers, clearance space of at least 10" is required.